Castle Resorts & Hotels, one of Hawaii’s premier hotel and resort management companies, has officially launched its newest property on Kauai. Called The ISO, an acronym for Island. Sky. Ocean., the 79-room hotel offers a private, oceanfront retreat on the island’s famous Royal Coconut Coast. Formerly known as the Mokihana Resort, the property underwent a $5 million renovation of the lobby, guest rooms, exterior and grounds. The ISO is the only property on Kauai’s east shore that literally sits on the ocean’s edge without any form of separation. 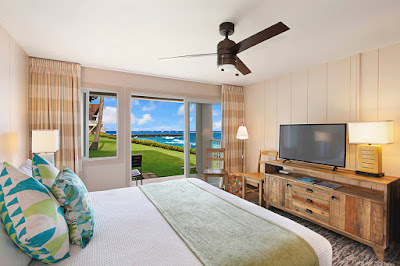 As a result, all of the rooms offer ocean views. The guest rooms feature a rustic, contemporary décor and include a refrigerator, coffee maker, flat screen TV, WiFi, Bluetooth, USB capable clock radio, logoed canteen coffee mugs and refillable water bottles. Guests also enjoy use of yoga mats. Among the property’s amenities are an oceanfront swimming pool, large grass courtyard with lounge chairs and tiki torches, fire pit, and filtered water station. The ISO is also home to the island’s number one-rated Bull Shed Restaurant, which specializes in gourmet steaks, prime rib and fresh island seafood. Perfect for the active traveler, The ISO offers guests yoga and other fitness options on the oceanfront lawn as well as bikes to explore the area and the four-mile coastal trail. It is also conveniently located to hiking trails, golf, waterfalls and gardens and is centrally located 10 minutes from the airport and in close vicinity to the shops and restaurants at the Coconut Marketplace. Rates range from $115 for an ocean view guest room to $435 for a one-bedroom ocean view room and are commissionable to travel agents. All guest room rates include a complimentary continental breakfast from 6:30am to 10:30am daily. A $10 daily resort fee includes water bottle, bicycle use, yoga and other fitness options on the lawn, parking and WiFi. For more information, call (808) 545-3510 or visit TheISO.com.